There are not many things that these two microscope types have in common. Both electron and light microscopes are technical devices which are used for visualizing structures that are too small to see with the unaided eye, and both types have relevant areas of applications in biology and the materials sciences. And this is pretty much it. The method of visualizing the structures is very different. Electron Microscopes use electrons and not photons (light rays) for visualization. The first electron microscope was constructed in 1931, compared to optical microscopes they are a very recent invention. The biggest advantage is that they have a higher resolution and are therefore also able of a higher magnification (up to 2 million times). Light microscopes can show a useful magnification only up to 1000-2000 times. This is a physical limit imposed by the wavelength of the light. Electron microscopes therefore allow for the visualization of structures that would normally be not visible by optical microscopy. Depending on the type of electron microscope, it is possible to view the three dimensional external shape of an object (Scanning Electron Microscope, SEM). In scanning electron microscopy (SEM), due to the nature of electrons, electron microscopes have a greater depth of field compared to light microscopes. The higher resolution may also give the human eye the subjective impression of a higher depth of field. Sample preparation is often much more elaborate. It is often necessary to coat the specimen with a very thin layer of metal (such as gold). The metal is able to reflect the electrons. The sample must be completely dry. This makes it impossible to observe living specimens. It is not possible to observe moving specimens (they are dead). It is not possible to observe color. Electrons do not possess a color. The image is only black/white. Sometimes the image is colored artificially to give a better visual impression. They require more training and experience in identifying artifacts that may have been introduced during the sample preparation process. The energy of the electron beam is very high. The sample is therefore exposed to high radiation, and therefore not able to live. The space requirements are high. They may need a whole room. When should one use optical (light) microscopes? One big advantage of light microscopes is the ability to observe living cells. It is possible to observe a wide range of biological activity, such as the uptake of food, cell division and movement. Additionally, it is possible to use in-vivo staining techniques to observe the uptake of colored pigments by the cells. These processes can not be observed in real time using electron microscopes, as the specimen has to be fixed, and completely dehydrated (and is therefore dead). The low cost of optical microscopes makes them useful in a wide range of different areas, such as education, the medical sector or for hobbyists. Generally, optical and electron microscopes have different areas of application and they complement each other. There are two different types of electron microscopes, scanning electron microscopes (SEM) and transmission electron microscopes (TEM). In the TEM method, an electron beam is passed through an extremely thin section of the specimen. You will get a two-dimensional cross-section of the specimen. SEMs, in contrast, visualize the surface structure of the specimen, providing a 3-D impression. 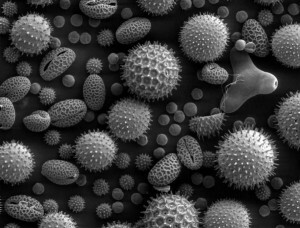 The image above was produced by a SEM. The two most common types of microscopes are compound microscopes and stereo microscopes (dissecting microscopes). Stereo microscopes are frequently used to observe larger, opaque specimens. They generally do not magnify as much as compound microscopes (around 40x-70x maximum) but give a truly stereoscopic view. This is because the image delivered to each eye is slightly different. Stereo microscopes do not necessarily require elaborate sample preparation. Compound microscopes magnify up to about 1000x. The specimen has to be sufficiently thin and bright for the microscope light to pass through. The specimen is mounted on a glass slide. Compound microscopes are not capable of producing a 3D (stereoscopic) view, even if they possess two eye pieces. This is because each one of the eyes receives the same image from the objective. The light beam is simply split in two. Thank you for giving these details. These have helped me making my bio project. Electric microscopes use a lamp, non-electric microscopes use a mirror as a light source. Not be be confused with electron microscopes. I managed to find adequate information here regarding my research. I found this really helpful, it answered my questions for me and also enabled me to understand clearly..Thank you..
-Sample preparation is often much more elaborate. It is often necessary to coat the specimen with a very thin layer of metal (such as gold). The metal is able to reflect the electrons. -The sample must be completely dry. This makes it impossible to observe living specimens. -They require more training and experience in identifying artifacts that may have been introduced during the sample preparation process. -The space requirements are high. They may need a whole room. to find out more information about the most incredible one of a kind Duel Scanning Electron Microscope and x-ray analyzer in the world (The Mini- Scanning Electron Microscope)! helped me for my homework but the information was hard to find. Would have better if there was a box showing differences. What about making a table for yourself and then posting it for all to read? This would certainly be appreciated! I need to use this information in my essay, would be helpful to know the name of the writer of this post outline. All of the articles on this web site were written by Oliver Kim. Remember: no copy-pasting of material from the Web! Do your research, cite your sources and write your assignments using your own words. Thanks this has helped me alot with my science assessment! Thanks a lot this has helped me a lot in my biology assignment!!! This helped me so much….i didn’t have my science book. lol!!! Do you have stuff on how the image was created? Thanks a Million! You made my entire semester by helping me to get started with valuable and informative helpful resourcing. Just to let you know, an advantage of a Transmission Electron Microscope over a Light Microscope is that you actually can observe living things, as otherwise detailed in your article. But the rest is great! What if we want to compare the results of images taken by Optical microscope and TEM. I basically need to relate the crystallization in an amorphous region due to the heterogeneous nucleation. Can it be said that the two images show the same feature regarding this? Thinks for giving differences between micrscopes. This was really useful for my school project. THANK YOU. It isn”t expensive at all. Pleasure you can’t measure my friends. It’s time to buy refurbished sems. The biggest Advantage: they are fun to use, and not complicated. Sample preparation is usually fast and they are suitable for hobby purposes.